As we derive our greatest pleasures from favors unintentionally bestowed, I desire to make my acknowledgments to those who have hunted up and furnished for publication, in the September CENTURY, my letter to the late Senator Foot, dated July 30, 1864. That letter was evidently written to prove that upon the showing of General Grant, himself, there was no charge affecting my military reputation, and I entered into no discussion as to the validity of General Grant’s reasons. That forgotten letter is valuable to me as showing to many friends, who in later days have questioned me on the subject that my statements in regard to my removal from command in July, 1864, are more at length but substantially the same as those furnished to Senator Foot on the heels of the occurrence to which it relates. All those who have heard my statements will, I think, bear me witness that after stating all the reasons General Grant gave at the time for his action, I have invariably said that I was in utter ignorance of the real cause which induced my summary removal from an important military command. When General Grant stated that he removed me because he could not relieve General Butler, I said that could not be the reason because General Butler was relieved by order of the President, and before I had been placed in command, but after I had asked General Grant to let me go to some other field of duty. From that position General Grant himself retreated, and then spoke of an article in the “New York Tribune” which he thought I had written. To that I replied, “You cannot have relieved me because you suspected me of writing such a paper ; and the truth is that I never saw or heard of the article until it was published, and have not the faintest idea of its authorship.” After this statement General Grant brought up two other reasons, equally without foundation, and all these reasons having reference to events which had taken place before my assignment to the command of the Army of the James. The charge that I had months before written two letters to two of General Grant’s most devoted friends to urge him not to carry out a particular campaign when he stood committed to another on the records of the War Department, is hardly worthy a reference. When General Grant closed the interview to which I have referred, he made a remark on which, with facts and letters in my possession, I based a theory as to the reasons which brought about my removal. 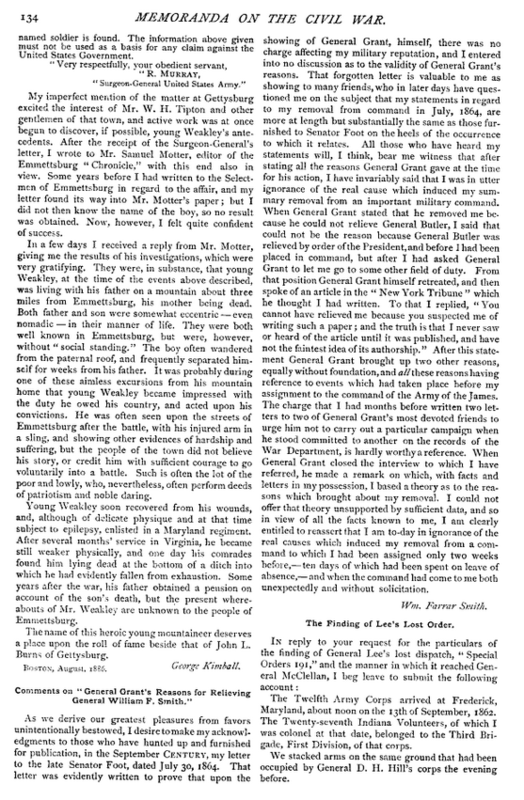 I could not offer that theory unsupported by sufficient data, and so in view of all the facts known to me, I am clearly entitled to reassert that I am to-day in ignorance of the real causes which induced my removal from a command to which I had been assigned only two weeks before, ten days of which had been spent on leave of absence, and when the command had come to me both unexpectedly and without solicitation.